Can Exercise Benefit You Emotionally And Socially? 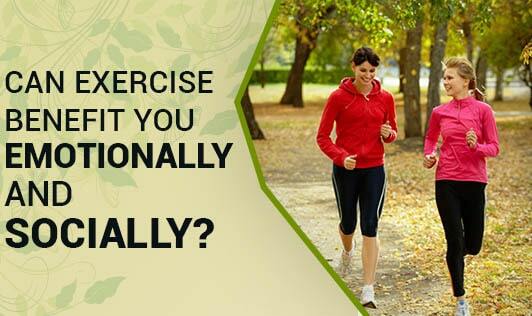 We are all aware of the physical benefits of exercise. We read about these benefits and discuss them with our family and friends. But, here’s an added incentive to get going. Exercising does have emotional and social benefits too. Reduces stress: Expending that physical energy helps reduce stress. Additionally, exercising increases concentrations of norepinephrine, a chemical that can moderate the brain’s response to stress. Helps to alleviate anxiety: Physical activity in the form of exercise helps release the feel-good endorphins that create feelings of happiness. Helps in boosting brain power: Studies have shown that cardiovascular exercises improve overall brain performance, helping with decision making, higher thinking, and learning. It also helps to improve your memory. Helps to improve self-confidence: On a very basic level, being fit boosts self-esteem and improves positive self-image. Regardless of size, gender, or age, exercising regularly can quickly elevate a person's awareness of his or her self-worth. Increases relaxation: A reasonable workout can sometimes work as well as a sleeping pill. Working out around five to six hours before bedtime raises the body’s core temperature, so when the body temperature drops back to normal a few hours later, it signals the body that it’s time to sleep. Helps to build and/or improve social relations: Working out in a gym or participating in group exercises such as aerobics or Zumba increases social activity and decreases feelings of loneliness and isolation. You meet new people who share common interests which could further lead to developing new social contacts. Focus on activities that you enjoy doing so that there’s no looking back. All the best!